It is so weird coming back to my hometown. The Laundromat is now an art gallery. Abstract zombie nudes are displayed facing Main Street, next to Rockwellian oil paintings of apple trees. The corner store’s become an upscale coffee shop full of white people with dreadlocks. Sipping my skinny, non-dairy, salted caramel latte, I’m torn between nostalgia and caffeinated bliss. The Jeep struggles as I mercilessly accelerate, running a yellow light. I laugh. Norman, Ohio has gone hipster. Never saw that one coming. Forgetting to slow for the railroad tracks, the Jeep bounds recklessly over. The satellite radio cuts out in the middle of White Stripes. Coffee splatters over my sweater. I wipe it off with a sleeve. Blotches now dot it. The family will notice. They’re going to be checking me for crow’s feet, and taking bets on whether I’ll ever marry again or just get a cat. Oh, God. My heart sinks into my stomach. I shove the coffee towards the cup-holder, spilling it all over the console. I don’t care. A four-lane highway now takes up what used to be a farm and Gram’s house. I yank the steering wheel and the Jeep skids into the parking lot of a brand new gas station. I park about where Gram’s rose bushes used to be. Leaning my head against the steering wheel, I know I shouldn’t have come here. Gram died in a nursing home three days ago. Seeing the house gone makes it worse, like she’s been erased. I miss her. Selfishly need her advice. What would she tell me to do? She wouldn’t, she’d feed me spice cake and tell me to get a cat. Static AM music scratches from the speakers. MC Hammer’s ‘U Can’t Touch This’. “Not even,” I slap the dial, silencing the radio. What is wrong with the satellite radio? I didn’t hit the railroad tracks that hard! Then everything changes. The gloomy overcast day is suddenly full-on sunshine. Blinking against it, I try not to see that the gas station is gone. I’m parked in the middle of a half dead rosebush of mammoth proportions. The backside of Gram’s butterscotch colored house is in front of me. Most of the leaves are off the maple tree, and the yard needs raked. There are clothes hanging on the clothesline even though it is the end of October. I’ve had a stroke. Oh my gosh, I don’t want to have had a stroke. I’m too young for a stroke. I nab my keys and root for my cell, coffee drips from it. I clean it with my doomed sweater, and slide it into a pocket. Swinging the door open, I get one leg out before it rebounds in Jeep fashion, against my leg. The smell of Maple leaves mixes with a familiar scent of baking, Gram’s poppy-seed cake. My eyes tear up and I slide out. I’ve had a stroke, I’m dead and this is heaven. Norman, Ohio is heaven. Never saw that one coming. I slam the door shut. Thorns jab through my pants, snagging the material. Automatically I stuff my keys into my pocket, and pat the other making sure I didn’t forget my phone. Like I’m going to be using it here. Is there cell reception in heaven? I’m about to test this theory when Gram comes around the corner of the house. She stops and stares at me. She’s alive and healthy, wearing her green housedress with her stockings rolled around her ankles. It used to be the in thing, back in the day, she told me that once. “Lizzy? Is that you?” The sound of her voice makes me cover my mouth and start to cry. That’s my grandmother! “Why did you park in the backyard? Elizabeth Marie, get out of my rosebushes! Those were my Mother’s! I brought a clipping with me….” Back in…carried in a handkerchief.... I echo the lecture inside my head. I remember this one! “Move it! What is wrong with you?” she grouses. I run across the yard and hug her hard. She smells like mint julep shampoo and laundry soap, like Gram, she pushes away and frowns. Her perceptive grey eyes are exactly as I remember, I don’t even care that I’m dead. “Gram? I…” I trail off, what do I say? I’m dead, we’re dead. Doesn’t she know? Why doesn’t she know? “What’s wrong?” she’s frowning. “You look so…tired,” she finishes diplomatically. “I’m on my way to a funeral.” I touch her. She makes her “tsk” sound, grabbing my arm. “Want a piece of poppy seed cake? You look skinny.” She’s my favorite person ever. We round the corner of the house and her old rat terrier comes barking. I’m not in heaven. Duke would never have made the cut. I still have the scars he gave me last time I gave him a bath. Bit me right on the nose. Duke died…I try to remember, it was before Gram started to forget. She opens the screen door and her cat wraps itself around my legs, purring. It died long before Duke. The wallpaper in the kitchen is outdated. Gram takes plates out of the cupboard and cuts the familiar poppy-seed cake. I can never make it like her. “Since when do you cook?” she teases. I almost answer, almost say ‘Jon, my husband who died,’ but can’t. My gaze moves to the kitchen table. Gram’s Scrabble board is set up. She always spent hours a day playing Scrabble by herself, trying to talk one of her many visitors into a game. Next to it is the newspaper. The front page has an article about the dawning of the computer age. It’s dated October 31, 1990. I was eighteen years old in 1990. I sit down at the table. Gram slides a slice of cake at me. “Now who died? You didn’t tell me you were going to a funeral this morning.” I lived with Gram in 1990. Am I in heaven? Or 1990? It definitely can’t be both, I remember 1990. I take a bite of her cake. Maybe 1990 is heaven. Time slows. Gram puts ‘Oxter’ on the board, pats my hand and gets up to make tea. I’m leaning towards heavenly 1990. Then a car pulls into the driveway. Tearing out from under the table, Duke conks his head on a chair, barking like the idiot he is. I’d forgotten he did that! I think I’ve missed him too. Jumping up and down, he wets a bit. No, I didn’t miss him. Standing, Gram plunks letters on the board and gives me her Scrabble victory smile. Obovoid. “Is that really a word?” I try to check if it is really a word on my cell, but there’s no reception in Heaven, or 1990. The dog barks so loud, I go to the door and look outside. It’s my Uncles. I shove through the door and we hurry outside. They’re digging in the trunk of a convertible. I remember this car! Slamming the lid, they look at me. I stare back at them, suddenly not sure. These are my Uncles, I decide after a minute. Except they’re young, and good looking. My stroke theory makes a comeback. It can’t be normal to think your Uncles are attractive. Definitely a stroke. Duke is jumping up and down, nipping at my handsome Uncles. Gram holds onto the railing to step off the porch. I dart forward and kiss her. She grins. I race for the backyard and Duke chases, snapping at my feet. We both hop into my Jeep. He starts licking the spilled coffee off the console. I don’t care why or where, I’m glad I’m here. I slam the door shut and everything disappears. The sunshine is gone and I’m staring at the Quik-Fil gas station again. My cell rings in my pocket. Automatically I dig it out and answer. It’s my sister. Slowly I turn to look. Duke shows me his teeth. Not exactly a cat. Never saw that coming. Emergency Unicorn hunting happens at work too. There are customers in, and your boss is schmoozing for the big contract. She runs her pantyhose. Who sneaks out to Macy’s for the Control-Top, Sheer Toe, Opaque, Support, Queen-Size Fishnet Stockings? The Emergency Unicorn hunter that’s who. In charge of office supplies? All the mechanical pencils are for size 0.5mm lead, but all the refills are size 0.7mm. Who gets to Staples only to find out they close at 7:00 p.m.? The Emergency Unicorn hunter that’s who. So who hits Staples on-line and orders a year’s worth of copy paper just so she spent enough and can have that lead delivered overnight for tomorrow morning? You got it. The Emergency Unicorn hunter is good at what she does. A loved one in the hospital is forced to eat hospital food for weeks. After mentioning how he’s been dreaming about chicken pot pies at night, who races to the drive-by chicken joint ten minutes before it closes, and pleads for someone to make just one more chicken pot pie? Yes, tonight, please – I’ll trade you some free movie passes? The Emergency Unicorn hunter that’s who. (And sadly she’s not above bribery at times.) Unfortunately Emergency Unicorns often involve shopping, but not always. Your son is in his room, we think. There is an obscene pile of Legos in his room and a voice comes from under them, “Mom? I need another piece that looks like this one.” A little arm pops out of the pile. It is clutching the smallest Lego piece ever made. Who knows there is another bit just like that one, in the mudroom, inside Dad’s shoe? The Emergency Unicorn Hunter that’s who. Your daughter is growing into a fine Emergency Unicorn hunter herself. “Mom, when I was in Indian Guides I had a vest with feathers on it. I need one of those blue feathers right now.” It’s been over ten years and at least three moves since Indian Guides. Who knows exactly where that old leather vest is? The Emergency Unicorn Hunter that’s who. It was a bit of a thrill to be sent questing after an actual unicorn recently. Have you seen people greeting loved ones at airports with balloons or flowers? It was a last minute decision that our loved one needed to be met with a large stuffed unicorn. In the middle of my work day, after four hours of staring at the blinking cursor, I accepted the quest and dashed away. Scored the unicorn and arrived at the airport on time. Oddly enough it turned out to be one of those days where you run into everyone you know. You know people from church, your other job, and engineering conferences? And guess who got to stand in public, faking normalcy and holding that emergency unicorn? The Emergency Unicorn hunter that’s who. Are you an Emergency Unicorn hunter? I know I’m not the only one, and I know people who excel at it. How about sharing one of your stories with me? Usually I share Epic Slinky Dogs based on random drawings and blog followers. How about if we change it up today? Share your most pathetic or humorous Emergency Unicorn hunt with me. If it is particularly touching, I’ll send a Slinky Dog your way. At least until I finish off this open box of them. Please follow my blog, if you haven’t already. Right over there ---à where it says “Join this site” (or Networked Blogs). And be sure to leave a comment below, for a chance at your very own Slinky Dog! Remember to check back to see if you’ve won, I will post winners here, and attempt to locate you. If I can’t contact you, or don’t hear back within a week, I will pick another name. Once you enter the gorge below the dam, there is no turning back. We’re sitting in a large raft on a Saturday morning. Right now we’re tied securely to the rocks. The dam begins to release water. We’re going to ride a bubble of wild water downstream. Are we thinking about the three and a half miles of river we’ll soon be paddling through? Or the Class IV Whitewater we’ll be battling? Maybe remembering last year’s rafting trip? The one where the guide fell out, and when we pulled him onto the edge of the raft, the whitewater took his pants down. (Luckily I think he had prehensile toes, cause he caught them before the river took them.) Nope. Right now I have two far more immediate problems. Whitewater Rafting in Maine is cold. I think everything in Maine is cold. It’s August and everyone is wearing full wetsuits. This is a summer trip with an adventurous group from work. This morning we all crawled out of our tents before dawn, ate some food and stood in line to get our wetsuits. And once again, when asked publicly for my weight, I lied. Some people are such slow learners. Once this suit gets wet, I may need the jaws-of-life to get out of it. The other factor contributing to my distraction is Juan. He’s the guy from work, the one I went out with whose car caught on fire. The one who tried to kill me mountain climbing, and who got me rescued by the ski patrol on our second date, yeah him. We work for the same company, but in different cities. Yet here he is - all great smile and looking pretty darn nice in his properly fitting wetsuit. Bet he didn’t lie about his weight. We’re clinging to the rocks waiting our turn to release. My raft mates are starting to get nervous about the wall of whitewater coming for us. Except Juan, he’s talking about swimming. Seems Juan was on the swim team in high school. Figures. My coworker, Tari, is very nervous. Unfortunately when she gets nervous she starts to talk, a lot. So far she’s regaled us with tales of her visit to the Lady Doctor last week, the time she got arrested for shop-lifting as a teen and now she’s informing Juan that she probably can never date him on account of the way he ties his shoelaces. I’m not nervous about the whitewater, mostly because I didn’t wear my contact lenses and can’t see much. I do wish Tari would hush, though. Between her and Juan, my commune with nature is being infringed on. Then Tari informs the entire raft that I left my underclothes on beneath my wetsuit. This faux pas proves a huge distraction and lightens the mood in the raft. So glad I could help. Thankfully it’s our turn and we’re off. Tari, Juan, and my underclothes are forgotten. Whitewater rafting blows your hair back and takes your breath away. Maine scenery flitting by is gloriously spectacular. Here is my muse. I’ve been looking for her! We’re leaning partially out of the raft, digging those paddles in deep, obeying the commands of the guide and flying downriver through churning, swirling chaos. Surrounded by roaring whitewater, grey cliffs rise sharply on both sides, and there’s only whitewater in front of us. It smells like cold and pine. It is spectacular. There is a trick to keeping your balance as you plow through the water. I’m using shifting bodyweight to stay inside the tossing and turning raft. Right now I’m glad for every pound. The tight wetsuit is forgotten at this point, I think I’m too excited to breathe. The guide roars instructions as we race through powerful roller-coaster-like waves. We are soaking wet and loving it. The rapids have names like “Big Mama,” “Magic Falls,” and we’re heading right into “Maytag,” named for the washing machine. Maytag is the piéce de résistance on a good day like today. With Class IV whitewater, this puppy is terrifyingly awesome. I’m listening to the guide’s shouts, digging in with my paddle as instructed. There’s whitewater everywhere, the people in my boat are hidden inside it. Then something very strange and confusing happens. Suddenly I’m sitting on a rock right in the middle of the Maytag, and the raft is gone. I don’t know how I got here. Quicker than thought the rock is gone too and I’m in the rapids. At the time I was not aware that a giant wave had brushed me out of the boat as easily as though I were the lightweight I’d claimed to be. Then the entire craft upended and spilled everyone out, washing downstream, upside down and unmanned. Of course we’re wearing life jackets, those huge beefy uncomfortable ones that strap between your legs. The problem is the water is sucking me down anyway, and when the life jacket pulls me back to the surface, whitewater is blowing over my head. It’s chaos but all I know is I need to breathe and there’s no air. Suddenly there’s somebody in the water with me. They wrap arms around me, lifting me briefly out of the whitewater. I climb up and over this person, to rise above the water. There is air up here. Thank God. Clarity returns with oxygen. The person beneath me is making strange sounds. It’s a guy and I’m drowning him, somehow I can hear it. Some small animal part of me is only concerned with oxygen for several breaths. Then I let go, and the whitewater takes me. I see the blurry form move away, Juan. Really? We have to try to look good drowning too? I’m not playing by these rules anymore. That day proved to be my lucky day in several respects. As the second to the last raft heading downriver, we could have been stuck along that wall for a very long time. Fortunately the last raft saw us flip. The guide, a tiny blonde with gorgeous biceps, maneuvered her raft right alongside us and the three of us toppled in. Though banged up, everyone from our raft was fine. We met up on a beach downstream, and guides cooked us a massive lunch. Which I ate, all 5-6” and 140 lbs of me, deal with it, I do. Apparently Juan doesn’t mind it because he sidled up beside me with a bowl of granola. I ate the M&M’s out of it while he announced that I would have one spectacular bruise on my backside, though he used his own words. He’d seen me eject from the boat and land on the rocks. Thanks for sharing that with my coworkers, though. Then he turned those golden eyes on me and right in front of the marketing department asked if I’d be interested in meeting his parents, and I said, “Sure. I’d love to meet your parents." So did you see that one coming? And have you ever met someone in an unexpected way, and they had a big impact on your life? Someone you sat next to on a bus? Fender bender? How did you meet your best friend? 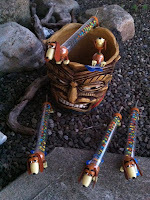 The Epic Slinky Dog Giveaway continues here at The Glitter Globe! (I ran into Slinky Dog while shopping for an Emergency Unicorn, by the way.) Please follow my blog, if you haven’t already. Right over there ---à where it says “Join this site” (or Networked Blogs). And be sure to leave a comment below, for a chance at your very own Slinky Dog! For every five new followers, a random name is picked from the comment section. Remember to check back to see if you’ve won, I will post winners here, and attempt to locate you. If I can’t contact you, or don’t hear back within a week, I will draw another name. Today I was in the kitchen mixing up a spinach smoothie for lunch. My buddy Zeus had stopped by for an impromptu visit. Since I am the world’s worst part-time vegetarian, I’d fried him up a pound of bacon. Giants really like bacon. If you have a giant in your life, it is a good idea to keep some bacon on hand. He ate the bacon and watched me toss almond milk, yogurt, banana, fresh spinach and then a spoon of peanut butter into the blender. He asked, shouted really, because the blender is super loud, “Do you just look through the kitchen and toss anything in there?” “Yes,” I bellowed in reply – even though I’d shut the blender off now, “isn’t that how cooking is done?” Zeus never thinks my jokes are funny, but I don’t let that stop me. Peanut butter and bananas are two of my most unfavorite foods ever. Despite that I eat them both when I’m trying to make my jeans fit. Now that summer is over it won’t be possible to keep wearing my stretchy shorts everywhere. Sadly I got sick this summer. Do you gain weight when you’re sick? If you stop running all the time and sit around and write for a living you do. Also if you subsist on a diet of mostly crackers, orange juice and a trunk load of Luden cough drops you do. Fine. Maybe there were a dozen or so large bars of Lindt dark chocolate (with a hint of sea salt) involved. If this has happened to you too, all that matters is if you do manage to get your jeans buttoned, you can’t bend or sit in them. That means it is time to fight back, and not with new jeans, though that is a good idea too. The Perspective Diet is my weapon of choice. I’ve been down this road before, so I know what healthy foods to stock up on, no worries there. I can subsist happily on granola and spinach smoothies almost indefinitely. I’d rather write than anything, and the trick is to keep my cupboards well stocked with fresh healthy foods. The problem comes in, usually in the evenings when I’m stuck on a scene I’m writing, and somebody walks past with a bowl of ice cream. The law frowns on tackling a young child and sucking down his entire bowl of chocolate chip ice-cream, even if you do apologize after and put nice sparkly band-aids on any boo-boos. The latter probably wouldn’t happen anyway, forget the sparkly band-aids I’d probably be in the kitchen getting a refill on that ice-cream. Don’t judge! Have you only eaten liquid spinach all week? It’s not only vampires that get hungry and fall off the wagon you know. So this is how the Perspective Diet works. You stock the house up with plenty of junk that you don’t like. I hope you’re a picky eater, this works much better if you are. I buy things that I’d never eat. My house is stocked up with plenty of ice-cream and prefab cookies in those flavors I really dislike. Children can now roam the corridors safely at night with their treats. This takes effort, and you must take care to shop for these unpleasant treats while you are at your strongest. Do not stray into the dark chocolate aisle. Do not go into a bakery. Do not go out to eat anywhere unless it involves Vegan or Sushi – and eventually you’ll be able to get those jeans on again without a wrestling match. To me it is all a matter of perspective. If I fill my life up with foods that make me feel good and move faster, and shun that which doesn’t, I get far better rewards than comfy jeans. Unfortunately my family claims the Perspective Diet has sinister motives. The world is just chalk full of conspiracy theories, isn’t it? They claim that I’m fattening them up, so that I simply appear thinner. Now who would do such a thing? Besides, they’re more than welcome to a spinach smoothie anytime they like. What is your perspective on diets in general? And how do you feel about spinach smoothies? I’m sharing my recipe with you, and if you think it sounds gross, I double Slinky-Dog DARE you do try one and report back. Toss everything into a regular blender (yes, it will actually liquefy the spinach just fine). A few ice-cubes if you want to make the concoction more of a smoothie consistency. Don’t forget the straw. Then come tell me how good it was, because it really is yummy. Speaking of yummy treats, Slinky Dogs have no trouble slipping on their jeans. 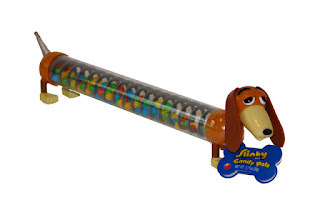 The Epic Slinky Dog giveaway continues here at The Glitter Globe. Please follow my blog, if you haven’t already. Right over there ---à where it says “Join this site” (or Networked Blogs). And be sure to leave a comment below, for a chance at your very own Slinky Dog! For every five new followers, a random name is picked from the comment section. Remember to check back to see if you’ve won, I will post winners here, and attempt to locate you. If I can’t contact you, or don’t hear back within a week, I will draw another name. Let’s start with décor, shall we? If you get to decorate your heaven, what will it look like? I’m thinking Roman Garden, perfect weather. Oddly enough, there sits a desk with a laptop right on my terrace. Angels are Tech Support. Sigh. In person. Sigh. You rarely need them though, because MSWord didn’t make it through the Pearly Gates. To publish the book after I’ve finished writing it, I hit “send”. Okay, maybe I send a query e-mail that says, ‘I wrote this book, read it.’ This is my heaven after all. What décor did you choose? And what will occupy your weekdays in your heaven? There are dogs in my heaven, but they don’t shed and they are born house-trained. They’re all my favorite dogs from earth, only now they behave, mostly. They are, after all, dogs. There is no housework here because nothing gets dirty or messy. If you like to clean, you can change that up to suit your own version. Cats sleep in the sun on the garden wall now and then; I don’t know who they belong to. Yard work is not necessary, everything grows neat and orderly. This is a place where cooperation reigns. Except on Saturday nights, when all heck breaks loose…um, well, it is my heaven after all, right? And I like to entertain, especially now that there is no prep work or clean-up involved. All those parties I meant to give on earth, yep, that is what we do on Saturday nights around here. Nobody minds how much time I spend writing either. They’re all busy with their own heavens. There is a self-replenishing glass of iced-tea with a fresh slice of lemon – and no condensation on my notes. I don’t need notes, I remember everything. Ah, now that is heavenly. And Jamie Fraser, from the Outlander series by Diana Gabaldon (turns out he is real here, yep) stops by and rubs my shoulders while I type. (In his kilt.) My husband doesn’t mind either, because his hands are busy fly fishing. Besides Jamie’s just rubbing my back, People! There are rules in heaven too, sheesh. Family and friends gather in the evenings. We sit in the garden and chat up old times, tease about the differences in our heavens and listen to my music – live – every night. Remember this is my villa. Maybe it’s different in their heaven. There are homemade muffins or croissants with dark chocolate for breakfast, fresh squeezed orange juice and full-on fat lattes in real cups, big ones. I don’t know who does the baking, but it’s divine. For lunch I always meet someone. Sometimes one of my children, and we catch up on what happened after I left town and how life is in their own heaven. Sometimes it is with an old friend. We meet at a little café around the corner. It has the best gelato. Sometimes I get a hamburger, which is okay because I am the worst part-time vegetarian in heaven too. Dinner is often al fresco, and a family affair, or sometimes at a romantic seaside getaway with Dear Hubby. There is always dessert. There are libraries to wander through, and all the questions I’ve ever had? It’s all in there. Snorkeling and skydiving require no equipment, oxygen is optional and what’s the worst that can happen anyway? We are in my heaven, after all. Some days I run, just for fun, because I’m fast now. While I’m out I swing by other heavens and look people up, enjoying their space for awhile. My Bohemian Gram has the exact same kitchen she had when I was a kid, but her pet monkey now weeds her flower garden and the only sound he ever makes is a quiet, “I’m sorry. I’m sorry. I’m sorry.” I don’t feel bad for him, at least he got into heaven and I for one never expected that. I think Gram pulled some strings, for a lot of us probably. The variety of heavens is astonishing. My BFF has drums in the parlor of a three-story Victorian. Comrade enjoys a parade every day, in her honor (she earned it). There’s an entire forest where children live in tree-houses and eat only ice-cream. Be careful if you stop in. They share, but gave me worm ice-cream once. Kids. Now you’ve had a glimpse into my heaven, it’s only fair that I get a peek into yours, right? Tell me about your heaven. What does it look like, and what do you do there? Is every day Saturday? Or Christmas? Who are your neighbors, if you have any, and what kind of music are you listening to? Just out of morbid curiosity, does yours involve a kilt-wearing masseuse too? Not that I’d drop by uninvited or anything.